I just entered the half century mark. For those of you who do not like to think it means I am 50. Now I realize women rarely admit their true ages, but I must admit age doesnt bother me. Health, aches and pains or the other trappings which can go with this I try not to focus on.I read once that age 54 was the best for a women. I will let you know in 4 years if that is true or not. Hard to believe I wrote the above 4 years ago. It is now 2006. And was age 54 the best, I do not know yet I still have a few more months to go , and anything is possible. I will say In many ways it has been the best. I went on a wonderful cruise with my girlfriends to Mexico. I have learned being alone does not translate into feeling lonely. I grew up next to the shores of Lake Superior. I lived in Wisconsin, later working in Minnesota. I worked in Duluth for 20 years before deciding I had reached that stage in my life where I could fullfill a dream of mine. That dream was to leave winters behind and to enjoy the balmy days in Florida year round. Now any of you who have spent time in Florida realize our summers are not balmy. They are hot and muggy. Never the less the winters are paradise and worth every drop of sweat I drop June to Oct. I can honestly say I dont mind the heat. Its much more tolerable than the heat was back north. I work as a nurse. Gardening has been a hobby of mine for many years now. 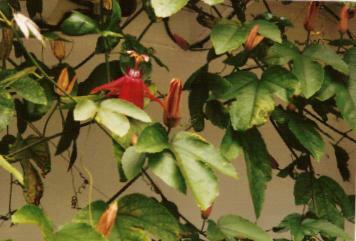 The above Red Passiflora vine was grown by myself. At times I will include various pictures of my plants and trees in the yard. I am very proud of them. The other thing I am passionate about is fishing. I love to go boating and fishing. My favorite movies. I have many. Gone With the Wind. a favorite since childhood. The mini series the Thorn Birds. I enjoy many different kinds of movies so will not waste anyones time with an entire list. Frank Sinatra, The Big Bands, Bette Midler, Barbara Streisand,most of the Broadway Hits. I also enjoy R&B,Easy Listening, Rock and Roll, and some heavy metals from the days of the sixties, most anything except country. Now I will say there are some country artists I do not mind. But country is not first on my list.